This time I'm looking for a sturdy, good quality alt-az mount. While I do like my EQ mounts I have rediscovered the joy of AZ-mounts, having the option of panning freely around the skies without having to carefully plan my observations or doing multiple meridian flips. For my grab-and-go scope (Vixen SD81S) I am using a Vixen Porta II with HAL130 tripod. I would rate stability as ”adequate” for that scope, but not for anything much larger than that. 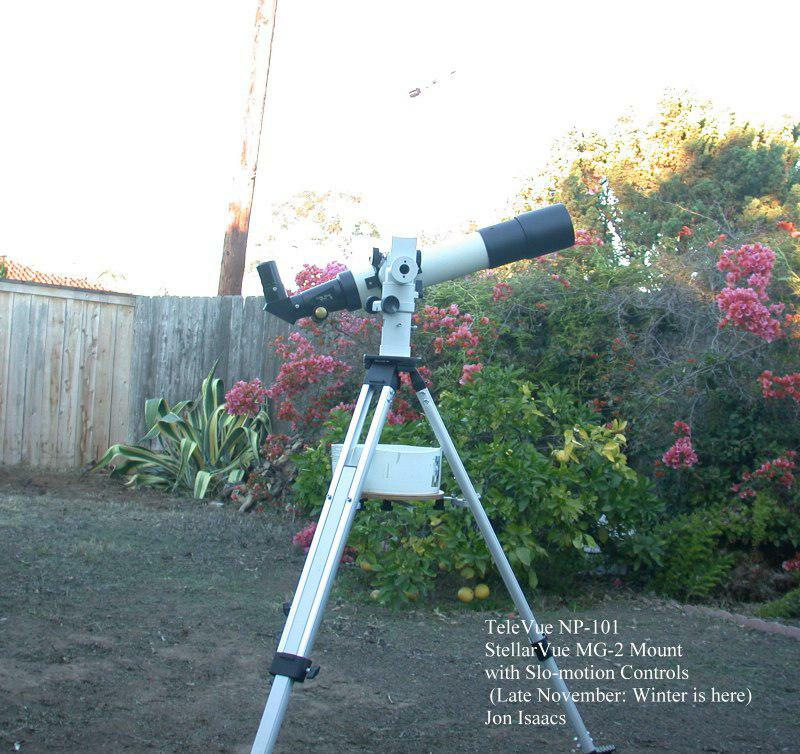 So, I'm looking for a stable Alt-Az mount for my Tak FC-100 (vintage 1981, so somewhat more substantially built than the modern FC-100) and my Celestron C8 with dew shield. Low weight is a plus, but not strictly required. Stability is more important. Dual-telescope capability is a plus but not a requirement. Both seem very well made. The Vixen APZ has lower capacity than the AZ8 but is lighter. But with a rated capacity of 8kg, will it carry the C8 or the FC-100? The AZ8 is much beefier, but there are reports of stuttering in the slow-motion controls. Tough choice, really. I would appreciate if you could share your views and experiences. Also, am I missing some obvious candidates for a good alt-az mount here? I live in EU, so I have a preference for mounts available in the EU. The first two mounts are capable to carry the F100 and the C8 at the same time (both ends). Look for all three for a sturdy tripod. I used the inexpensive t-sky mount for my c8: it is somewhat bulky to move (close to 10kg with the tripod) and very roughly crafted, but it is very sturdy and allows for very high magnifications (>300x). It has 2 clamps, but one is placed awkwardly atop the alt axis (think that was planned for binoculars), forcing to resort to a counterweight. The APZ is okay - I've tried it with my VMC200L, it was fairly sturdy, but already near the limit. I already have a Porta II, and if I was getting a second alt-az mount with slow-mo, I would get one beefier than the APZ - the APZ is only a mild step-up. The way I see it, if you're going to have 2 alt-az mounts, better to have a 5kg and a 10kg payload mount, instead of a 5kg and 8kg.. now I haven't actually tried the Skytee 2, but based on user reports, it sounds beefier than the APZ, and 10kg is a good estimate. I liked the APZ, but it's not enough of a step up over the Porta II to own both in my opinion. I find slow motion controls get in the way of the joy and simplicity of alt/az mount’s. The DM4 is the ultimate in precision and stability. Whatever you decide, don’t underestimate the importance of a quality tripod in the setup. Traveler: Thanks for the advice: On your advice I am currently taking an extra, closer look at the AOKSwiss AYO II mount and the Giro Ercole mount. Apart from the lack of slow-motion controls they seem to fit the bill perfectly: Well made, high capacity, reasonable weight, and even dual-telescope support (with optional saddle plates). Price seems reasonable too, but I do find it odd that an equatorial mount with similar capacity can be had, including tripod, for considerably less money. I already own a Vixen HAL130 tripod which will be used with the mount. I guess I would also have to invest in an extension pier for the tripod to avoid hitting the legs with my refractors. Simon B: Thanks for the heads-up on the surprisingly low gain in capacity of the Vixen APZ over the Porta II . I was actually wondering if it would be a worthwhile upgrade from my Porta II, maybe silently hoping that the Porta II's rated capacity of 5 kg was "optimistic" (I'd say it is, in my experience) due to being "made in China" and that the Japan-made APZ was more "realistic". But it seems from your experiences that the difference in real-life capacity between the too mounts is just too little to justify upgrading from Porta II to APZ. Especially since I would also need to get an additional extension pier for my tripod to use it without having my longer refractors hit the tripod legs. Maybe if I didn't already own a Porta II, the APZ would seem like a much more attractive option for grab-and-go. Hesiod: Thanks for the pointer to the T-Rex. I've been eyeing out these, but I'll never get one, for sure. They aren't made anymore AFAIK, and I would feel bad paying more for my mount than what I paid for my scope anyway. But it looks like a very nice mount. I've also come across the Skytee II in various incarnations, rebranded by many dealers. The lukewarm reviews have kept me away from it, and your own description of the mount's quirks reinforces my resolve to look for something better. Quality is more important for me than low price. Thanks for honestly sharing your experiences with it.  Allan Wade: Thanks for sharing your experience with the DM4. It sure looks like a quality mount. However, the rated capacity is just 8kg, the same as the Vixen APZ, and from my own experiences I doubt I'll be satisfied with anything that is rated less than 50-100% more than the actual scopes that I'll be using together with the mount. Apparently I'm quite sensitive to scope vibrations. AOKSwiss AYO II: Seems to be back-ordered everywhere, but looks solid and is arguably the prettiest of the mounts (IMO, of course ). Giro Ercole: Seems to be in stock and even more solid than the AYO. Losmandy AZ8: The only one with slow-motion controls, but the odd quirk of the az-control reportedly not rotating with the scope, together with reported slow-motion stutter, may in part negate that advantage. Also, it's the most expensive and heaviest of the three mounts. It does seem like a well-engineered mount, though. Anyone have experiences comparing the AYO II with the Giro Ercole, visual use only? Any quirks I need to know of? Edited by db2005, 20 January 2019 - 02:24 PM. No slow motion controls and no dual scopes but I like both scopes on this mount. I have a UA Doublestar that does dual scopes really well for both of these simultaneously. No longer in production but may be available used. You are right, it does seem to meet my requirements, and I have come across the Skytee 2 under many different names, but it seems to receive mostly "meh" reviews: rough mechanics and finish, lack of smoothness, poor saddles, reliability issues, surprising design issues, etc. It possibly my own fault: As I get more and more experience with still higher-quality astronomy equipment I have become less tolerant of poorly engineered mechanics. I'm not arguing that Skytee 2 is a poor mount (and I have never seen one in real-life), but reading about other people's experiences with the Skytee 2 has until now left me with the impression that I'm not likely to be satisfied with it. Edited by db2005, 20 January 2019 - 02:40 PM. If want absolutely slow motion controls may look for a manual GEM and use it as alt/az: not every model can do the trick, and likely will need counterweights, but second-hand models are dirty cheap. - It's a robust mount and should carry either scope with authority. I used with my NP-101 to around 300 x. With the 120 mm Eon, 15 pounds and 36 inches long, I'd go to 360x most every night , 500x + on occasion. No problem.. Stable. - I like slow motion controls on a refractor mount. Working at high magnifications , tracking and centering are just so much easier. The MG-2's slow motion controls are effective and the ability to adjust the friction is very handy . The one flaw is that the azimuth slo-mo is fixed to the base rather than the rotating part so sometimes the knobs are right there where you want them , sometimes they're around the back where you have to reach for them. The Portamount got this right.. The MG-2 Sky Tee did not. In terms of mechanical quality, I rate it as similar to the Portamount, adequate but not a mechanical jewel. 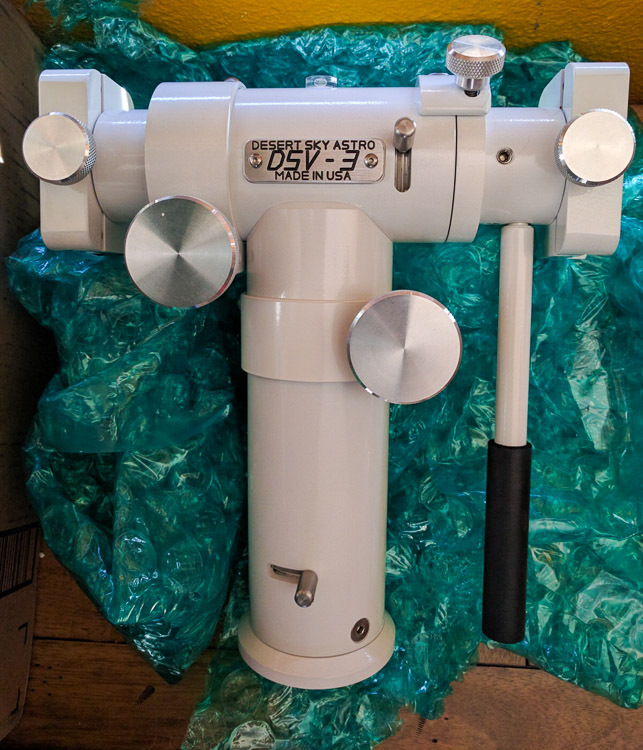 If you can find a used (sadly, new ones are no longer made) Universal Astronomics Unistar Deluxe mount it will be up to the task. 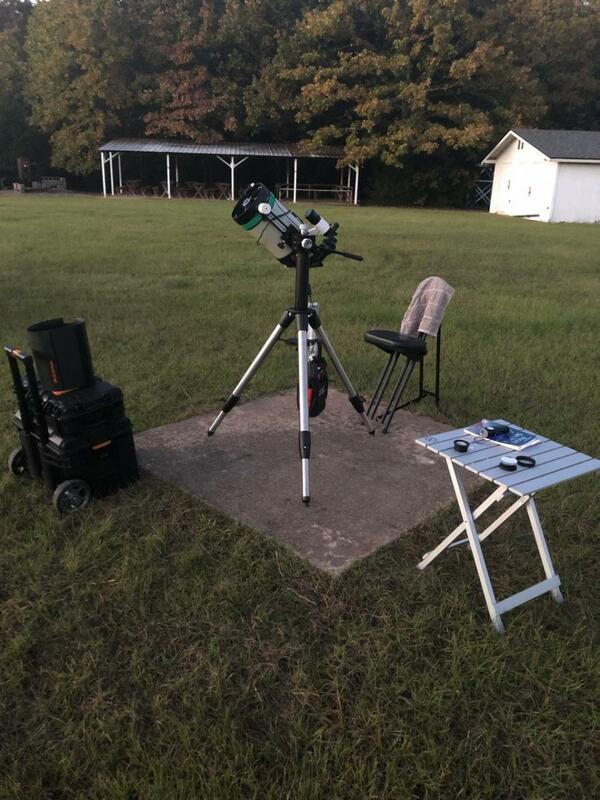 I can recommend the DSV-3 mount by Desert Skies Astro if you don't mind the wait. I use mine with an Orion pier extender on a CG-5 2" tripod. Used with my 76mm Sears, 80mm ED and 120mm EON. Jon: Thanks for sharing your experiences with the Stellarvue MG-2. It sure looks much like the Twilight II mount, but without the odd-looking counterweight-arrangement for the second scope. I haven't been able to find similar incarnations of the mount. The closest one is the Omegon AZ Deluxe - which doesn't have slow-motion controls, and seems to be an entirely different mount. 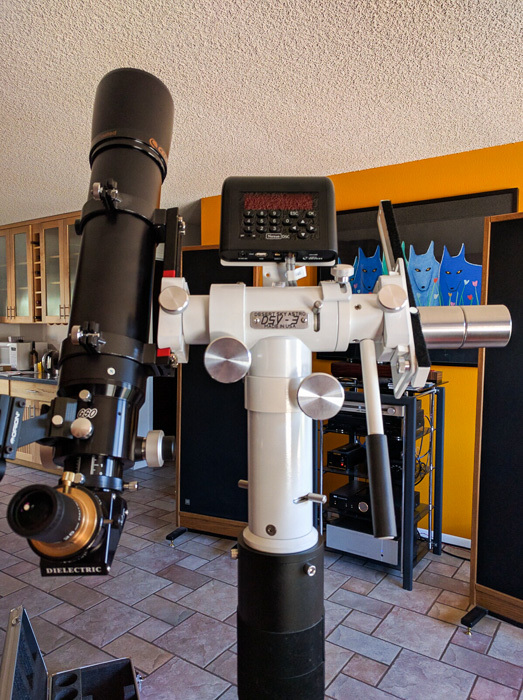 Terra: I searched the web for the Unistar Deluxe, and it looks like a beautiful and capable mount for sure In particular I like the apparent simplicity of the mount. There is a lot of good things to be said about simplicity. Jim: that DSV-3 looks really great too, and it looks fairly reasonably priced. I do wonder if I can use the mount head with my HAL130 tripod. I believe it uses a 10 mm thread. Being situated in Denmark it looks like you get all the best stuff in the US. While I have imported hobby equipment from the US before I still have a preference for buying from inside the E.U. It's just easier when dealing with a European dealer who manages all customs and possible warranty claims. But that DSV-3 really looks sweet. Btw. I have recently contacted a Germany dealer who listed the Losmandy AZ-8 on their website. They said that Losmandy can only deliver sporadically and that they can't set a delivery date. I don't know exactly what that means, but I'm guessing delivery could take several months if even possible. Edited by db2005, 22 January 2019 - 10:52 AM.